This print was created for the Tiger Lily Press Calendar and was inspired by photos I took of dried cecropia leaves in Costa Rica. The cecropia tree is an iconic Costa Rican tree and has a well-known relationship with ants that live inside the tree (you can read more about it here). But I love cecropias for their beautiful, deeply-lobed leaves that tend to curl up after they fall to the ground and create very interesting shapes. 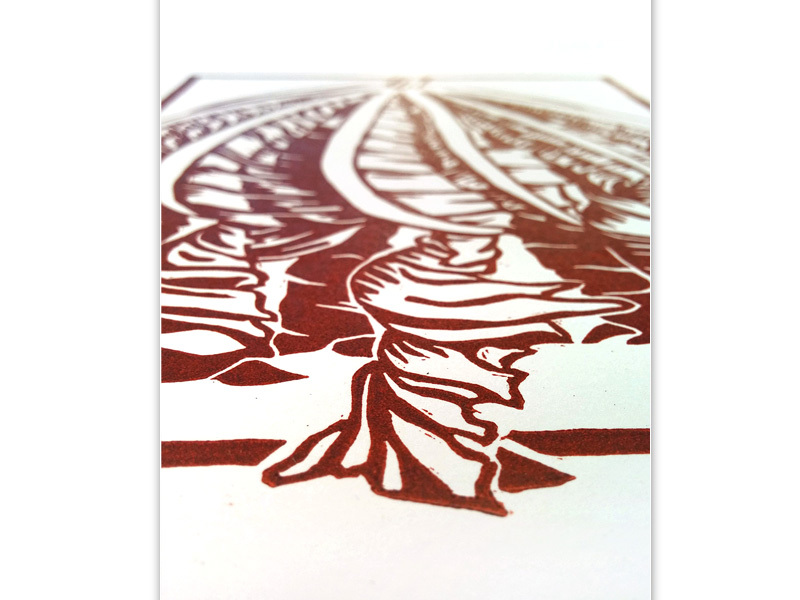 The lines created by the vein structure of the leaf were the perfect subject for a one-color linocut. Visit my blog Nessy Designs for further details about the process and more images. Every other year Tiger Lily Press creates a calendar to raise funds for their programs and I was very excited to participate this year. The calendar includes original screenprints, linocuts, woodcuts, suminagashi (marbled paper), and letterpress prints using one or two colors. The calendar was designed so the buyer can easily cut the bottom portion off and frame the print. Each print is 6” x 8” and suitable for framing in a precut 8” x 10” mat and framed in a standard 11” x 14” frame. Each participating artist was asked to print 100 copies of their print to be included in the calendar so if you would like to buy one you'd better act fast as their are only 100 of these in existence! The calendar is $45 and you can purchase the calendars from the Tiger Lily Press website here. The calendar includes screenprints, linocuts, woodcuts, suminagashi (marbled paper), and letterpress prints from 12 artists. The months and dates have been set using letterpress type. SOLD OUT - The calendars are sold out, but if you are interested in this print I may have a print or two somewhere in my drawers. Send me an email if you would like to purchase one.